Vogue is certainly a place out of this world, like nothing and no one in it is real. Everything momentarily produced to be shot and archived. The documentary The September Issue , follows the woman behind the fashion bible that is Vogue, Anna Wintour, the Editor–in-chief and ice queen of fashion. 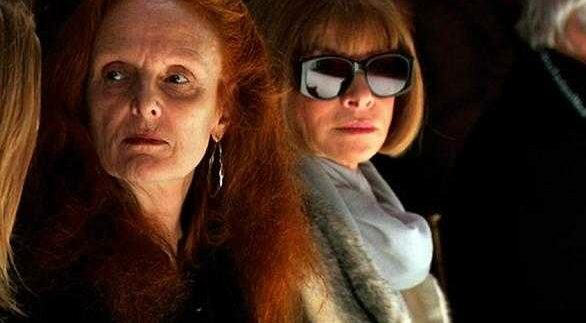 She is the inspiration behind Meryl Streep’s Cruella Da Ville fashion goddess in The Devil Wears Prada . The production of American Vogue’s September issue is infamous, and the 2007 one is until now the biggest one in the industry’s history with 840 fashion filled pages. The documentary follows Wintour and her numerous staff, through meetings and shoots giving us a glimpse on how the world’s biggest fashion magazine is run, how the September issue is put together, all the wheeling and dealing that goes into producing it. What the documentary also succeeds in doing is humanise Wintour, forever known as ‘Nuclear Wintour’, where in one scene she confesses, through slightly wet eyes, that her siblings find her carrier “amusing” and her daughter wants nothing to do with the fashion industry. “There are more things out there,” her daughter comments sarcastically. Anna is credited with changing many aspects of the industry; after all she brought back fur to the mainstream in the 1990s. “I wear it on my back,” she mockingly answers a reporter who asks how does she wear fur? But the Editor-In-Chief is also the one who replaced models on the cover with celebrities, and as Vogue’s Creative Director Grace Coddington, one of the stars of the documentary said, that was the beginning of celebrities taking over the super models’ role. Fashion lovers will cherish this film as much as they cherish Vogue and the dreamy world it creates. Cynics will find it satisfying to see that even Sienna Miller gets a neck and face photoshop job for her cover. Vogue, according to the film, sells around 15 million issues a month, and is a leader in a $300 billion industry that spares no cost or effort to achieve its goal, where pictures from a fashion costing $50,000 are removed from the final production lay out as Wintour dismisses them as being “done before”. Anna, like fashion, looks forward to the future, to what’s next and the film leaves you wanting to see the product behind that feverish work. Compelling and fun to watch, this feature comes from director R.J. Cutler, his first big screen project, after producing for TV the past 10 years. You don’t have to be a fashionista to enjoy and appreciate this documentary; even those who are anti-fashion will appreciate it.